your regional insect pest monitoring resource! WEEK 0: Spring has sprung and we need field sites. Broccoli plantings will be starting soon, cooperating growers are encouraged to contact me to reserve their spot. Cutworms and armyworms are likely going to be a problem this year. Many have been spotted already, even on campus sidewalks (see below)! This species is especially fond of ryegrass and orchardgrass, and outbreaks have occurred in western Oregon. So..why did the caterpillar cross the road? Because it overwinters as a partially mature larvae and peristaltic searching mobility increases when ambient temperatures exceed 10°C, of course! Posted in armyworm, pest ID. 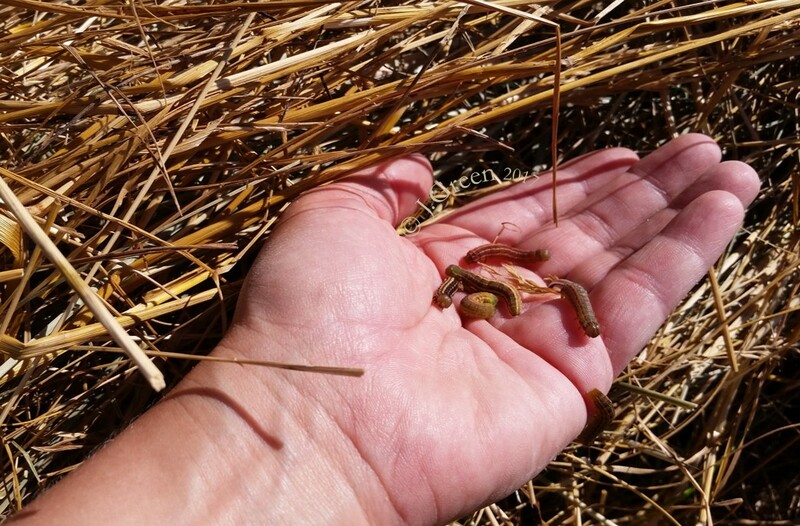 WEEK 21 – Armyworms continue to plague forage and small grain growers. OSU Extension has had dozens of calls about the issue, and we are working closely with them to identify solutions. Read the full report here: http://bit.ly/VNweek21 and subscribe on our homepage to receive weekly newsletters during field season. Posted in armyworm, rootworm, winter cutworm. WEEK 18 – Diamondback moths are exploding, and I try my hand at interactive maps! Read the full report here: http://bit.ly/VNweek18 and subscribe on our homepage to receive weekly newsletters during field season. Thanks! Looper activity is far above ‘normal’ this year, and more aligned with an outbreak we had in 2008. We monitor for cabbage loopers because they are pests of brassica crops. Feeding can occur on a wide variety of vegetable hosts including: beet, celery, cucumber, lettuce, pea, pepper, snap bean, spinach. Not all hosts are suitable for complete development of the insect, but feeding is feeding, from a grower or gardener’s perspective. Posted in armyworm, black cutworm, corn earworm, diamondback, loopers. 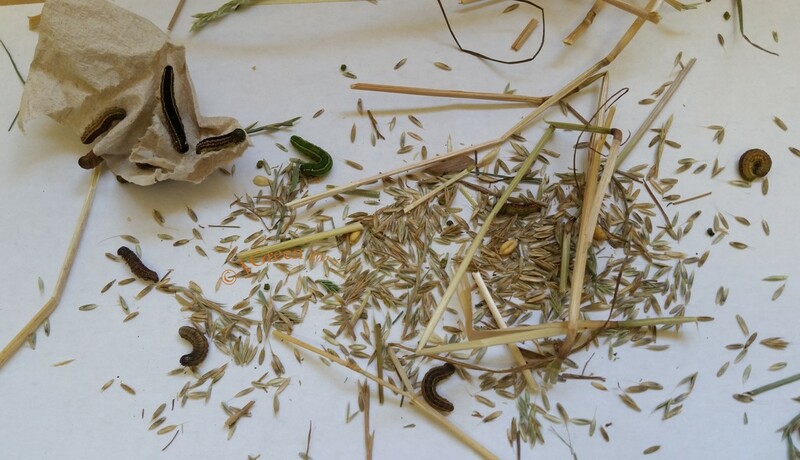 WHAT: An epidemic of various cutworms and armyworms is occurring in grass seed fields in the Willamette Valley, and has led to severe contamination of harvested seed. The problem went unnoticed until fields were being cut, and high numbers of caterpillars were present in hopper bins and loads brought to seed cleaners. WHY: Outbreaks occur every decade or so, and most experts agree that extensive fall and winter moisture is a major contributing factor. This is because, for many species of cutworms and armyworms, there is moisture dependency. This simply means that more eggs hatch if there is more rainfall, irrigation, etc.. In fact, my first-ever tweet was about this very topic! Additionally, cool, wet springs are detrimental for beneficial insects such as parasitoids and predators that usually keep cutworm and armyworm populations in check. Average monthly precipitation levels recorded in Corvallis. High moisture levels contribute to armyworm and cutworm outbreaks. WHICH: In grass and pasture crops specifically, there tends to be a ‘species complex’ of related Lepidopteran pests all present at the same time, which can make identification difficult. Furthermore, coloration of larvae can vary extensively between individuals. Coloring can be influenced by population levels, host plant feeding, etc. From a management standpoint, this may not seem important because the pests can usually be treated as a group. However, in order to better understand the biology and develop predictive monitoring tools for the future, species identification is key. Dargida procinctus – olive green cutworm. Light and dark larval forms, specialist feeding on grasses (Poaceae), and particularly prefers tall coarse grasses such as orchard grass and ryegrass. Outbreak occurred in 1980 Willamette Valley, and may be part of the Dargida species complex affecting E. OR and WA wheat growers (wheat head armyworm). Mythimna unipuncta – true armyworm. A common pest, outbreak occurred in 2015. Adults are most common in late summer, but spring migrations are possible. Larvae are recognizable by alternating stripes of light/dark on the sides of the body, and dark netting on the eyes. Spodoptera praefica – Western yellowstriped armyworm. This species is native to the western US, and closely resembles S. ornithogalli. This is a species of interest, I have been tracking it since 2015, more info to come. Wide host range. HOW to scout for and manage: Unfortunately, the damage is done for the current harvest, but continued scouting is recommended. Sort through windrows and get down to the soil surface, where frass (evidence of larval feeding) will be notable (see figure below). Sweep netting is ineffective. Also be aware that harvest / bailing may cause any remaining armyworms to move out of the field to surrounding weedy areas, vegetable crops, etc. Try to examine field edges at night, and apply border treatments if necessary. I have noticed signs of biological control on a number of larvae, which could help mitigate populations. FOR MORE INFORMATION: Consult the PNW Insect Management Handbook, and this pest alert put out by OSU Extension. As one of Oregon’s top 5 commodities, the fact that grass seed harvests are having an insect problem is a big deal. Over the past few weeks, seed has been arriving at the cleaner with high incidences of contamination by an unknown caterpillar. Wheat processors also are affected. Based on timing and just a few photos, I have a good guess about what this is. Looking forward to getting some samples ASAP! Please contact me if you’d like more information. 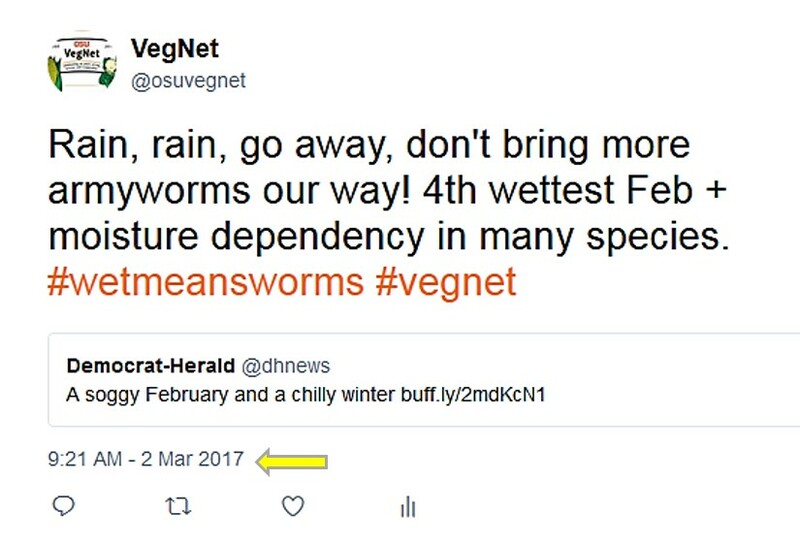 ….Cutworms and armyworms, that is. Many studies report increased activity of these pests in years following record rainfall, and moisture dependency is common. This simply means that more eggs hatch if there is sufficient moisture in the soil. Spodoptera praefica is native to the Western U.S. It is considered a generalist feeder. Larval feeding causes extensive defoliation of leaves and also fruit damage. As the name implies, these worms are gregarious (feed in groups), and therefore can cause extreme damage. Host plants include: alfalfa, asparagus, bean, beet, cabbage, carrot, corn, clover, lettuce, onion, ornamentals, pea, potato, wheat, and many others. Apamea cogitata is considered a pest of grasses and grains (Poaceae). It is a cutworm, and has one generation per year, usually peaking in mid-July. This species is widespread in the Northwest. One of the identifying characteristics is a pink-hued fringe on the margins of the hindwing. 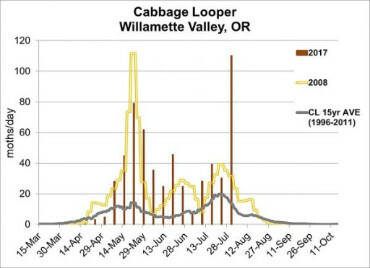 * Continued pressure of cabbage loopers. An outbreak occurred in the Valley in 2008, when trap counts reached 100+ per day. Review last week’s post for details, interpretation of looper flights, and recommendations for scouting. * A diamondback moth ‘point-concern’ for the Corvallis location. More data will be available in the coming weeks. * True armyworms (M. unipuncta) are not traditionally monitored by VegNet, because damage is most notable in grasses and forage crops. However, feeding on peas, beans, and brassicas can occur in outbreak years. Visit the armyworm page for more info. Posted in armyworm, diamondback, loopers. © 2019 VegNet, all rights reserved.